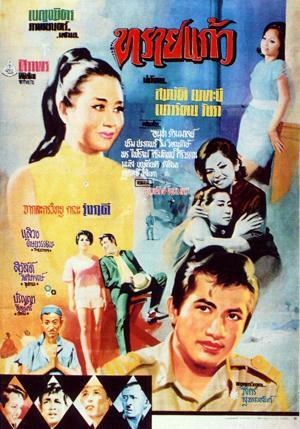 This Naowarat Watchara movie page contains 8 records. ไม่มีวันที่เราจะพรากจากกัน (There is no day we will split) was released in year 1971. The full movie lasts 2h27mn. The remaining film is in a poor condition. The image has no more color and is only tinted. Unfortunately the sound is distorted and barely hearable. A full movie summary is still available as some old Thai movie stars magazines can still be found nowadays. The movie remains famous for its 9 to 10 songs. A few songs are sung by Sithao Petcharoen and Songthong. One of the famous singer in this movie is กังวานไพร ลูกเพชร, a countryside singer (นักร้องลูกทุ่ง). He is acting as a couple with Naowarat Watchara in this movie. Main actors in this romantic movie are Aranya Namwong and Sombat Methanee. Interesting to see that Aranya Namwong is wearing big sunglasses that are back to fashion in decade 2010s. Other actors include Prachuap Ruekyamdee, comic actor Sukon Koewliam, Naowarat Watchara, Chana Sriubon, Sopha Sataporn, Ratanaporn Intarakamhaeng, Ruj Ronnapop. Kampee (Sombat Methanee) is orphan but gets patronized by his older sister Rampoei, who is married to rich merchant Vivat. Kampee (คัมภีร์) is engaged with Rewadee (Naowarat Watchara). He goes to study abroad. When he comes back, his fiancee Rewadee is going to marry Pinjo, who was a former friend. Kampee, disappointed, causes big arguments during the wedding, gets beaten and thrown away in the water. When he wakes up, he meets for first time a young woman called Ailada (Aranya Namwong), riding a bicycle and going to help him. Surprised, he leaves rashly by taxi (คนบ้า). Kampee leaves his home as Pinjo’s father forces him to go to Sukhothai province. Rampoei wants Kampee to marry Walli, younger sister of Vivat. Kampee meets Ailada again in Phitsanulok train station and they argue again. Kampee shall be the head of forest guards in district Huay Krai. Kampee is welcomed by Plang (Prachuap Ruekyamdee), his assistant. Ailada is Plang‘s daughter! Kamnan Preuang (Sawin Sawangrat) is doing illegal business in the forest by cutting trees. Plaew, son of Kamnan Preuang, loves Ailada since they are kids. Plang and Kampee have a plan to stop those illegal activities. Having learnt this, Ailada informs Preuang. So Kampee's plan fails. Aware that Ailada is the one who disclosed the plan, Kampee has arguments with her but Ailada finally understands and recognises her mistake. Love starts to emerge. Walli is coming to visit Kampee. To get rid of Walli, Kampee claims he is already engaged with Ailada so she has mischievous behavior with Kampee! Kamnan Preuang and Plaew get agreement with Pinjo to use Rewadee to ease Kampee. Pinjo wishes to kill Kampee as he cannot stand to have Rewadee close to Kampee. It is discovered that Plaew is the real son of Plang and not Preuang. Plaew and Ailanda are then brother and sister! Plaew and Ailanda are looking for Kampee knowing he is endangered by Pinjo’s plans to kill him. A thunderstorm happens. Kampee and Ailanda take refuge in a cave. A snake is threatening them. Plaew and Rewadee take refuge in a cave also. Pinjo misunderstands Plaew’s intention to help Rewadee. He finally falls in the river and dies. Back from the forest, learning that Kampee and Ailanda plan to marry, Rewadee still tries to get back Kampee and simulates to have spent the night with him. It causes Ailanda’s ire, who then flees away. Rewadee apologizes but it is too late. Ailanda is gone and Kampee is back to Bangkok. Kampee indulges in alcohol and finally accept his sister’s proposal to marry Walli. Rewadee is pregnant with Plaew. As Ailanda is back to district Huay Krai, Plaew decides to stop Kampee’s wedding with Walli to ensure Kampee can marry Ailanda! Plaew lies that Kampee made a young lady pregnant in district Huay Krai so he needs to assume. Finally Kampee and Ailanda are reunited. 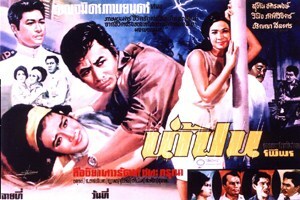 “Sai Pin” (สายพิณ) is a Thai movie released in year 1968. Main actors are Sombat Methanee and Naowarat Watchara. 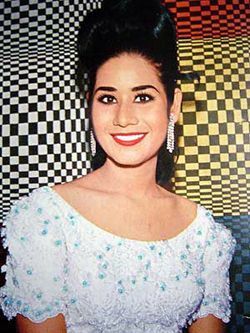 Actress Naowarat was just famous after playing her first role in movie “Chula tree koon” (จุฬาตรีคูณ) with Mitr Chaibancha in year 1967. She even got a Thai cinema golden award (รางวัลตุ๊กตาทอง). สายพิณ is her second movie. The next next famous movie featuring Sombat and Naowarat was “Lom Krot” (ลมกรด). “Sai Pin” (สายพิณ) full movie was supposed to be lost. Finally in year 2013, a final 16mm copy was found belonging to a former outdoor cinema projectionist. The full movie is then still available in Thailand and lasts more than two hours ten minutes. It was never released in any video format. A 20mn extract can be found online. The picture is still very colorful. The movie features also two songs. Sombat rents a house (มาเช่าบ้าน). Ruj Ronnapop is the second tenant. He claims to be rich but has no money. Ruj also claims to be the son of a famous company owner (Preuhat Boonlong). Sombat is the real son but he believes his father has maybe another son with a second wife. The two sisters (Naowarat and สุชาวดี มุกดาประกร, new actress starring for the first time in this movie) are renting part of their house. The company warehouse was burnt. Who did it? Sombat is investigating. The sister gets raped by the ruffian head. As usual, the police arrives when everything is settled down. In the older movies, it was almost impossible to find a movie where bad guys would win. The movie ends up by a double wedding (Sombat / Naowarat and Ruj / สุชาวดี มุกดาประก). Ruj is finally also adopted by Sombat’s father as he is finally a good guy also. 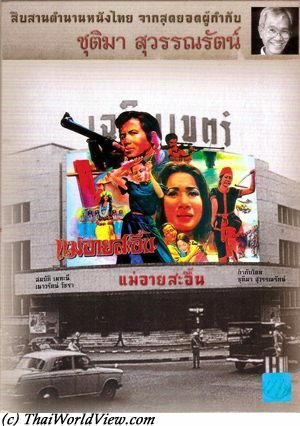 ทรายแก้ว is a Thai movie released in year 1968. 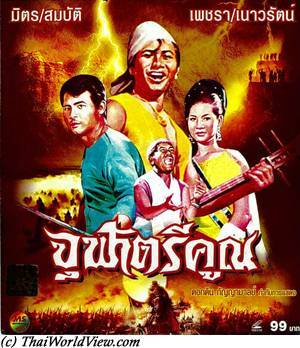 This movie is a lost movie in Thailand as only one reel is left and it is the last reel. The reel is in 16mm format so there is no sound available as such format requires live dubbing. Previously one dubber was used in small theaters and two dubbers in big theaters. No movie summary is left. It is a romantic family drama with Sombat Methanee and Naowarat Watchara as main actors. Other actors are Sithao Petcharoen, Sukon Koewliam, Anucha Ratanaman, Prim Praphaporn. Prim Praphaporn has no more the main role but second role (นางรอง). Sombat and Anucha rescue Naowarat. 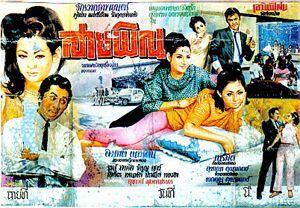 Anucha kidnaps Naowarat and sends her on a boat. Following a fight with Naowarat's father, Anucha falls on his own knife and kills himself. Naowarat and Primpaporn get reunited with their father. Following a last misunderstanding, Naowarat and Sombat finally marry.